Plato regained his appetite and is now eating canned dog food. It’s sort of limbo land. I seriously did not expect him to get his appetite back. A couple weeks ago, I thought he’d be gone by now. He has the worse time getting up and sitting down, however is walking…slow, but walking, even faster than a couple weeks ago. I have no idea what is going on. It’s sort of like LOST…he was supposed to die in a plane crash, but he’s still on an island trying to survive. Weird metaphor, but closest I can describe. Maybe he just needs to let go, but he’s so clingy. Plato is still hanging in there, but I know the end is so close. A few weeks ago he still ate regular dog food. Last week he would only nibble at canned food, and recently only allowed us to feed him real meat. Now he is refusing real meat. I was able to get some Trader Joe’s Dog Snacks down him. He still eats those. He is sleeping more now. Last week was very restless, waking up all the time to take him out. But now he lets us sleep more. Stan had the last couple nights because I have been completely wiped out. I will have to stay with Plato when he works the early shift next week, though. His breathing, which used to be labored because of his enlarged heart, is now slowing down. I have prepared myself for this for a long time, but it still breaks me up each time I face the inevitable. I have spent over $400 in the recent weeks at the vet’s. They can’t find anything wrong except for the enlarged heart, which we’ve known about for some time and are treating with Furosamide and Enalapril (sp?). They think his pain is due to arthritis. They could do a (sonogram? radiography?) but last time we put him through that, it was a dreadful time coming out of the sedation. I am not putting him through that again. We are just giving him as much comfort as we can. We’ll know when he wants to go, when he refuses all food and water and when he’s lost all desire for pleasure. 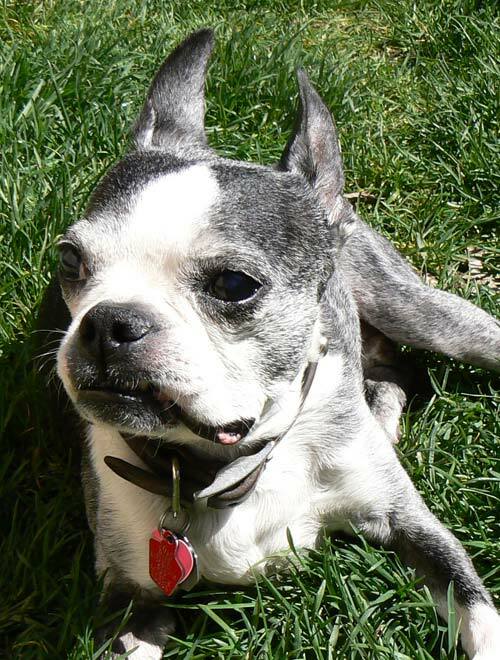 We knew that when Persephone’s time had ended and we had her put to sleep. Right now, Plato still loves to go for rides. We always put our dogs in their kennels when we travel with them, and when Stan takes the kennel out, Plato always barks so he won’t be left behind. Last night, despite his lameness, he followed Stan out to the van, up the incline to the parking stall. It was the cutest thing. There has been no time for a life while running Plato’s Nursing Home. Stan had a few days off that he’d requested months ago to get work done in the garden and on the house. Ha! Most all time was spent doting on Plato and making life better for him. Shopping for pajamas at Target may not seem related to Plato, but it is, considering I never wear pajamas. We’re taking turns staying with him at night in the living room, and running him outside in the middle of the night. Which means I have to be clothed somewhat to at least stand at the backdoor while I wait for Plato. I wouldn’t be able to do that in my normal nighttime attire. When we go grocery shopping we take him with us. He loves car rides and is the best behaved when we he is a passenger in motion. I just got interrupted with a phone call and have lost my train of thought. It derails a lot lately. I have been through so much. 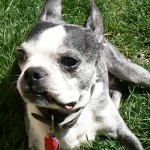 Within the past few weeks, I have been through so much turmoil as my beautiful Boston Terrier, Plato is dying. Plato is over 13 years old. I do not believe he can make it to 14 in August. He has an enlarged heart and heart murmur. He was diagnosed with this condition last year, yet all the time he was very agile and seemed normal, except he wasn’t active as he used to be. A few weeks ago, he decided it was time to get old. He started to limp, then scream in pain. He can no longer walk more than a few steps. Stan and I transport him outside to use the potty. He sits on a pillow when eating. Soon he will lose his appetite altogether. Then I know it will be time to let go. I am in tears as I write this. I have been in tears constantly since this started.